Adobe has launched Dreamweaver CS5, a new version of its professional Web authoring program to develop, test, and deploy Web sites and applications. Dreamweaver now features authoring and testing support for third-party, PHP-based content management systems like WordPress, Joomla!, and Drupal, allowing designers to get accurate views of dynamic Web content from within Dreamweaver. Dreamweaver CS5 also features access to Omniture SiteCatalyst and Omniture Test&Target Web analytics utilities from within the program and integration with new Adobe CS Live online services. The program's new Dynamically Related Files feature helps you access files and update pages faster, and simplifies site management. With a single click, Dreamweaver can discover all of the external files and scripts needed to assemble a page and display their filenames in the Related Files toolbar. With Live View enabled, Dreamweaver renders the page as it will appear in the browser, complete with dynamic, database-driven content and server- and client-side logic. 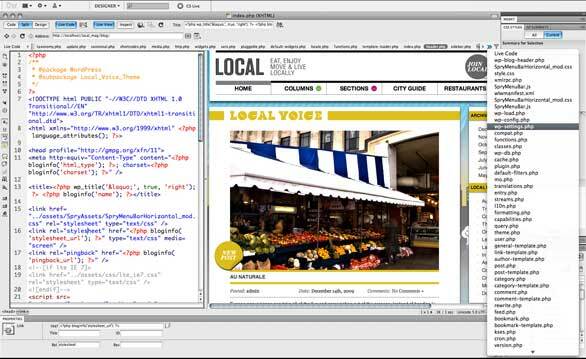 Dreamweaver CS5 lets you view, access, and edit any file related to your PHP-based site or content management system. Additional new features in Dreamweaver CS5 include: Enhanced support for Subversion versioning software, PHP custom class code hinting, site-specific code hints, color-coded CSS starter layouts, and a redesigned site set-up dialog. The Adobe Business Catalyst extension for Dreamweaver (available separately and in English only) and the Business Catalyst online service (also available separately) let you create Websites, online stores, brochure sites, and mini-sites without coding. Dreamweaver is $399 with an upgrade price of $199. It’s available in the Web Premium package and the Master Collection. It runs on OS X 10.5.7 or 10.6. The new version of Contribute, a program for non-designer content authors, offers a host of updated features including predefined content types, XML editing, cross-browser preview, spry widget editing, and multiple page search and replace capability. With predefined content types, Web administrators can specify particular Dreamweaver templates, XML templates, and workflows to use when creating new pages, based on content. This lets users build new pages quickly by referencing existing site designs. The feature preserves established page functionality and defines content regions that contributors can edit without damaging the page design. Users can now update the contents of XML files rendered by dynamic pages within Contribute. Content authors can update XML data without disturbing the underlying structure of the page. Users can also edit Spry data sets and other dynamic pages that render data content from an XML file, or even entire dynamic sites built using XML. With the cross-browser preview feature, Contribute CS5 content authors can verify the look and feel of updated pages themselves, in multiple browsers without having to install them. Contribute is $199 with an upgrade price of $99. A five-user multi-pack is $799. It also ships with the Web Premium package and the Master Collection. It runs on OS X 10.5.7 or 10.6. In the new version of Fireworks, Adobe's vector-based graphics program for creating user interfaces and Web applications, the focus is on refining existing features to accelerate and streamline the design workflow. Now, you can constrain object proportions, edit gradients, and adjust stroke alignment directly from the Properties panel. Fireworks CS5 provides higher quality and greater control of gradients, thanks to improved fidelity of gradients imported from Photoshop and Illustrator. Fireworks CS5 offers improved performance and more precise control over the pixel placement of design elements. You can export your Fireworks designs in FXG format (an XML-based graphics interchange file format for the Adobe Flash Platform) to the new Adobe Flash Catalyst CS5, where you can add interactivity. Fireworks can now open and create Adobe Swatch Exchange (ASE) files, which can also be used in InDesign, Photoshop, and Illustrator. ASE files created with other CS5 applications can be imported into the Swatches panel in Fireworks, allowing you to work with color schemes created in other projects. You can use the Compound Shape tools to create complex and editable vector shapes more easily, group multiple vector shapes as you draw, and apply nondestructive path effects. 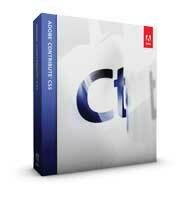 Fireworks CS5 is $299 with an upgrade price of $149. It’s available as part of the Web Premium, Design Premium, and Master Collection. It runs on OS X 10.5.7 or 10.6. Dreamweaver CS5, Fireworks CS5, and Contribute CS5 ship within 30 days.